Insurance Q&A: The Right Travel Insurance Could Cover Your Costs If Zika Threatens : Shots - Health News Consumers worried that health issues might thwart a planned vacation may want to look into travel insurance that allows them to cancel the trip for any reason. 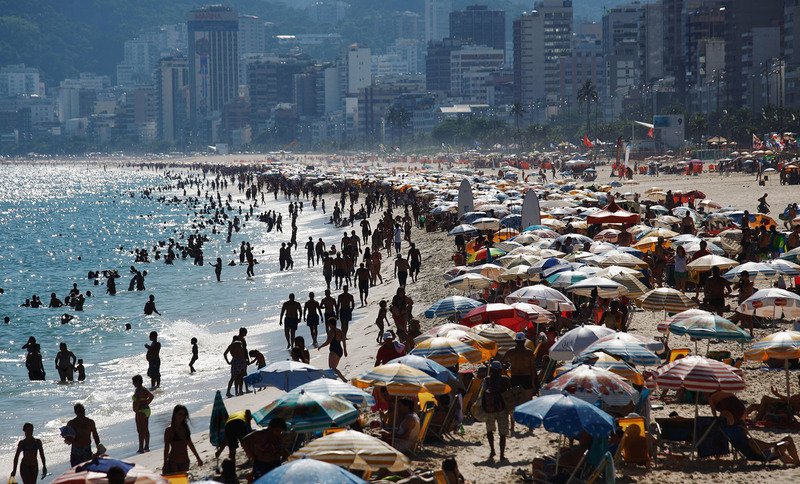 Would the threat of Zika lead you to rethink a scheduled trip to Ipanema beach or the Summer Olympics in Rio de Janeiro, Brazil? You'd need the right kind of travel insurance to cover the cost of a canceled trip. As the summer unfolds, people are understandably interested in whether travel insurance will cover them if they cancel a trip because of concerns about the Zika virus. Other readers asked whether student health plans are a better option than the coverage from a health law marketplace and how an employer can't offer mental health coverage. Here are the answers. My wife and I have a trip planned to South America, but we're increasingly worried about the Zika virus. We bought travel insurance when we booked the trip. If we cancel, will we be able to get our money back? A typical travel insurance policy won't reimburse you for trip expenses if you cancel because you're afraid of traveling to a country where there have been reports of an outbreak of a disease such as the Zika virus. But if you purchased a "cancel-for-any-reason" policy, your claim is more likely to be approved, said Megan Freedman, executive director of the U.S. Travel Insurance Association, a trade group. Like standard trip cancellation policies, these policies provide financial protection for unreimbursed expenses if you have to cancel your trip before it starts or interrupt it once you're there. These policies also allow you to cancel for any reason, including pregnancy, a particular concern with the Zika virus. They typically cost a bit more than a standard policy. If you cancel, you'll generally be reimbursed for about 75 percent of your prepaid expenses. The Zika virus causes only mild flu-like symptoms in most people, but if women contract it during pregnancy, it can cause a devastating birth defect called microcephaly in their baby. Researchers estimate that babies born to between 1 and 13 percent of pregnant women who are infected during their first trimester will have that problem. The virus is generally passed along through the bite of an infected mosquito. "Ask what if any concessions your hotel or airline is extending," she said. I'm leaving my job to go to graduate school this summer. The college offers a student health plan, but would I be better off buying an individual plan on the marketplace? Since I worked half of the year, I suspect I won't get much in subsidies. The best choice for you will depend on a couple of factors, including how good the student plan is at your school and your coverage priorities: Do you want a plan with generous coverage or would you prefer something that may have a higher deductible, for example, but probably has a lower price tag? Student health plans vary widely from school to school, said Stephen Beckley, a higher education health care consultant in Fort Collins, Colo. At many schools, coverage is equivalent to a platinum level plan on the state marketplace, meaning it pays 90 percent of the cost of medical services. A survey of student health plans at 38 public and private schools conducted by Hodgkins Beckley Consulting found average premiums were $184 at public universities and $217 at private colleges. A platinum-level plan on the health law marketplaces would likely run more than that, especially if you don't qualify for a federal tax credit to help pay the premium. On the state marketplaces, more than three-quarters of people who buy plans get premium tax credits, which are available to people with annual incomes up to 400 percent of the federal poverty level (about $47,000 for an individual). This year, after factoring in an average premium tax credit of $290, consumers paid on average $106 per month for coverage in the 38 states where the federal government operates the marketplace. Most people buy silver plans on the state exchanges, which pay for 70 percent of medical services, leaving them to pick up more of the cost of care than a platinum plan does. My employer does not offer mental health benefits. What can I do? You're in a tough spot. The federal mental health parity law doesn't require companies to offer mental health benefits. Rather, it says that if they do, the benefits have to be at least as generous as their medical/surgical benefits. Depending on where you live, you may be able to find a local mental health clinic or federally qualified health center that offers mental health services for less than you'd pay a private therapist, Bufka said. You could also check out universities near you that have training programs for mental health professionals. You might be able to work with a student who's under close supervision by a trained professional. "It's important for people to understand that psychotherapy does not need to be a forever thing," Bufka said. "It could be a 10 to 12 week intervention."